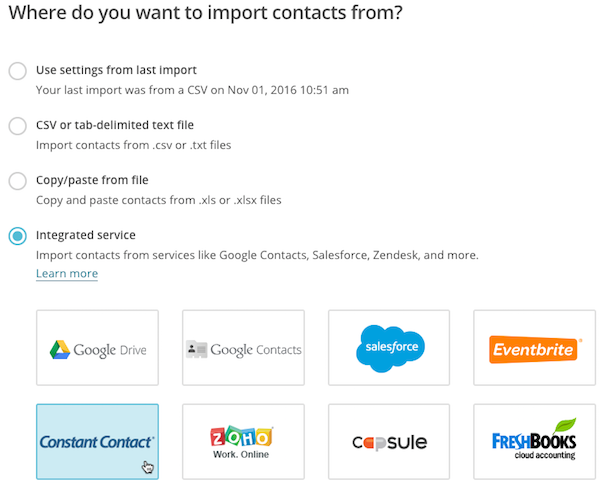 You've started the process to switch from Constant Contact to Mailchimp, and now it's time to import your contacts. It takes a few steps to import your contacts to Mailchimp, but when you're done, you'll be ready to get started creating beautiful campaigns. In this article, you'll learn how to move active contacts from Constant Contact to Mailchimp. Prepare your Constant Contact list before you import to Mailchimp to ensure that only active, useable email addresses are added. If you don't have an audience in Mailchimp, create one. To save time, you can import all Constant Contact lists in one batch. We'll place all contacts in the same audience, and store sublist information in a group that you can view and send to later. We can store up to 60 of your Constant Contact sublists. Mailchimp only supports one email address per contact. We'll save any additional email addresses from your list as text fields. To ensure proper formatting for certain features in Mailchimp, we'll merge your address data into one address field. To learn more about the address field, check out Format Guidelines for Your Import File. First, you'll need a CSV file of your Active Contacts from Constant Contact. To export all your active contacts, follow these steps. Navigate to the Contacts section. Click Active to view your active contacts. Check the box in the upper left corner of the table to select all active contacts. In the Export pop-up modal, choose the fields you want to include. Email address is the only field that's required by Mailchimp, and you can also include any additional fields. 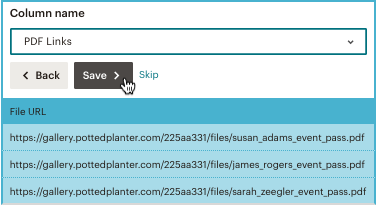 Check the List box if you want to transfer your sublists names into your Mailchimp audience. Click Export Contacts. When your export is complete, a message will appear at the top of the screen. Now that you have your CSV, you'll import active contacts to your Mailchimp audience. Choose Integrated service, and click Constant Contact. To upload your CSV file, click Browse and choose the file from your computer. Check the box next to I understand that my billing plan may be automatically upgraded. Click Next to move on to the Import Subscribers step and match the columns in your CSV file to the columns in your Mailchimp audience. If the first column is matched and labeled correctly, click Save. For example, the Email Address column looks like this. We automatically match the column in your import that contains email addresses to the required Email Address field in your Mailchimp audience. 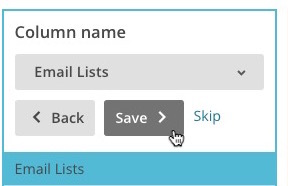 Click Save on the Email Lists column to transfer your Constant Contact list names to Mailchimp. On the additional columns, click Save, or click the drop-down menu to select a different field type. For columns whose labels did not transfer from your import file, choose New Column name, and type in your label. Or click Skip to exclude the column from the import. Repeat Step 11 for all unmatched columns. You must match or skip every column to complete your import. We'll display a success message when you're done. On the You're all set to import! screen, review the settings for your import. We'll display the method you chose for your import and the number of columns you matched. You can click Details to view which columns you matched to fields in your audience, or Edit to make changes. After you've reviewed your settings, click Import. You'll need to take a few steps before importing contacts from Constant Contact to Mailchimp. Learn how to prepare your list for a smooth transition.